Product Article Number 6ES7326-1BK00-0AB0 Product Description SIMAT.. Product Article Number 6ES7326-1BK01-0AB0 Product Description SIMAT.. 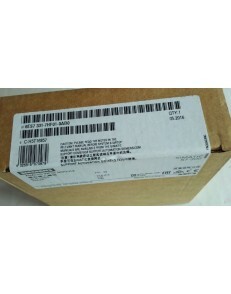 Product Article Number 6ES7326-1RF00-0AB0 Product Description *** S..
Siemens SIMATIC S7, DIGITAL OUTPUT SM 326, 10 DO; 24V DC, 2A, FAILSAFE OUTPUT MODULE FOR SIMATIC S7F.. Product Article Number 6ES7326-2BF01-0AB0 Product Description *** S.. Product Article Number 6ES7326-2BF40-0AB0 Product Description SIMAT.. Product Article Number 6ES7327-1BH00-0AB0 Product Description SIMAT.. Product Article Number 6ES7328-0AA00-7AA0 Product Description SIMAT..
Siemens SIMATIC S7-300, ANALOG INPUT SM 331, OPTICALLY ISOLATED, 8 AI, 13 BIT RESOLUTION, U/I/RESIST.. Product Article Number 6ES7331-1KF01-0AB0 Product Description SIMAT..
Siemens SIMATIC S7-300, ANALOG INPUT SM 331 6ES7331-1KF02-0AB0..
Siemens SIMATIC S7-300, ANALOG INPUT SM 331, GALVANICALLY ISOLATED, 8 AI, 14 BIT, 0.052MS/CHANNEL, C.. Product Article Number 6ES7331-7KB02-0AB0 Product Description SIMAT..
Siemens SIMATIC S7-300, ANALOG INPUT SM 331, OPTICALLY ISOLATED, FOR EXPANDED TEMPERATURE RANGE, 2 A..